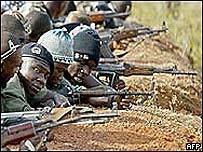 The United Kingdom has warned a UK company against recruiting mercenaries to work in Ivory Coast. Foreign Secretary Jack Straw said such an enterprise would seriously undermine the Ivorian peace process. He said he was gravely concerned at reports that Northbridge Services Group - a security company - was recruiting ex-servicemen from Britain, South Africa and France. But a release denied that they were a mercenary firm. "This contract was to provide humanitarian support and increased governmental security", the statement said. Services the company website says it offers, includes demilitarisation of warring factions, mine clearance, and special forces to counter terrorists and narcotics. Mercenaries from eastern Europe, South Africa and Angola have been accused of fighting on the side of the government since September's military uprising against the government of President Laurent Gbagbo. A peace agreement was signed in January and a power-sharing government has been named. The rebels have so far refused to attend cabinet meetings citing security concerns but now say they will be present at Thursday's meeting. The government has denied claims this week by the opposition Le Patriote newspaper that it has hired 1,000 South Africans to fight on its side. Reuters news agency quotes diplomats in Ivory Coast as saying that they have heard of the hiring of 300 fresh mercenaries. "Any deployment of foreign military units at this time would seriously undermine the peace process and the efforts of the UK and the wider international community," Mr Straw said. But Northbridge says Mr Straw's comments "come as a great surprise when it was he that strongly supported the use of private military companies in a office Foreign and Commonwealth Office". document. Ivory Coast, the world's largest cocoa producer, is now a divided country with the three groups of rebels controlling the north and a big part of the west of the country. The government controls the rest, including the economic capital Abidjan and the main capital Yamoussoukro.